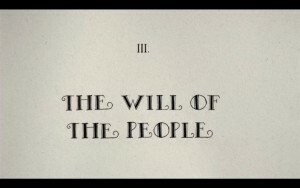 “The Will of the People” is Clement Wood’s title for Chapter XIII in his book, dealing with the same period. The title refers to Brinkley’s preferred version of the story of the gubernatorial race: “Thousands of Kansans have written urging me to run for governor,” he said. “Judging from my mail the people of Kansas seem to believe that I have been persecuted, not prosecuted, and as long as I have a leg to stand on I will fight'” (quoted in Brock, 155).